Chromebooks allow you to zoom in a single page or the entire desktop and interface. Chromebooks are inexpensive and lightweight, but their small screens are sometimes difficult to read. If you're having trouble seeing something on your Chromebook, you can zoom in a single window, like Chrome, or magnify the entire desktop so it's easier to see the interface and icons. Chromebooks also come with a built-in accessibility tool, allowing you to magnify small portions of the screen to make them easier to see. If your Chromebook is stuck zoomed in, or you lent it out to someone and got it back zoomed in, you can also use these techniques to zoom out or return the zoom level to normal. Zooming in on a single window, like Chrome, is extremely easy on a Chromebook. You accomplish it by pressing a specific key combination, and you can press the same combination repeatedly to zoom in further. The first step magnifies the window by 10 percent, and each subsequent step zooms you in an additional 25, 50, and then 100 percent until you've zoomed in as far as possible. You can zoom in a single window on a Chromebook by pressing control and plus. If you want to zoom in further, press Ctrl+Plus (+) again. You can continue pressing Ctrl+Plus (+) until you reach a maximum zoom of 500 percent. Zooming in on a Chromebook is accomplished in steps of 10, 25, 50 and 100 percent. If you accidentally zoom in too far, or you decide to return the screen to normal, zooming out is just as easy. Zooming out on a Chromebook can also be accomplished by pressing a combination of keys, and you can adjust the zoom level step-by-step just as you did when you zoomed in. Each step follows the same pattern as zooming in. You can zoom a single window out on a Chromebook by pressing control and minus. If you want to zoom out further, press Ctrl+Minus (-) again. Since you can zoom in and out on a Chromebook with a few key presses, it's easy to accidentally zoom in or out without noticing it. If you find that everything looks too big, or too small, on your Chromebook, especially after lending it to a friend or letting a small child use it, you can usually fix the problem by resetting the zoom level. You can reset the zoom level of a single window on a Chromebook by pressing the control and 0 keys. If the zoom level doesn't reset, try pressing Ctrl+Shift+0. This command resets the zoom level on the Chromebook itself, not just in a single window like your Chrome browser. If you don't want to use key combinations to zoom in and out on your Chromebook, and you just want to adjust the level in Chrome, you can do it from within the Chrome browser. Chrome has built-in zoom controls. Select the ⋮ (three vertical dots) icon. Locate Zoom in the menu. Use the Plus (+) and Minus (-) to adjust the zoom level to your liking. The default zoom level is 100 percent. In addition to zooming in on a single window, Chromebooks can also magnify the entire desktop. This is accomplished by adjusting the resolution of the display, which effectively makes everything bigger; you can do it by pressing a combination of keys on the keyboard. You can zoom in, zoom out, and reset the magnification level of the entire desktop on a Chromebook by pressing specific key combinations. Press and hold Ctrl+Shift. Keep these keys depressed the entire time you're adjusting the zoom level. Press Plus (+) again to zoom in further. Press Minus (-) to reduce the zoom level. Press 0 to reset the zoom level. When the zoom level is where you want it, release Ctrl+Shift. If your Chromebook has a touchscreen, you can use it to zoom in and out. This works just like it does on most smartphones. Touch the screen with your thumb and index finger and make a pinching motion to zoom out, and spread your thumb and index finger apart to zoom in. 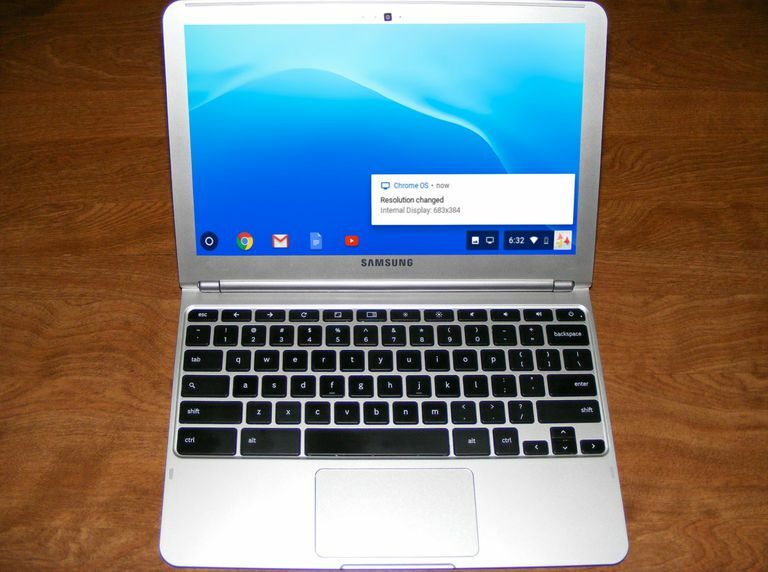 When you zoom in on a Chromebook, the interface and icons also get bigger. Chromebooks also come with a built-in screen magnification tool. This is useful for users who have trouble seeing small text on a Chromebook screen, as it allows specific portions of the screen to be magnified to a great degree. The Chromebook dock magnifier allows you to magnify small portions of your screen to a high degree. Press Alt+Shift+S on the keyboard. Select the ☰ (hamburger menu). If you see a gear icon next to the word settings instead, select that instead. Look for Docked zoom level, then select the zoom level to adjust it. Click Enable dock magnifier again to turn off the magnification tool. Yes, Chromebooks Can Take Screenshots! This Is How to Enable Chromebook Developer Mode, but Should You Do It?